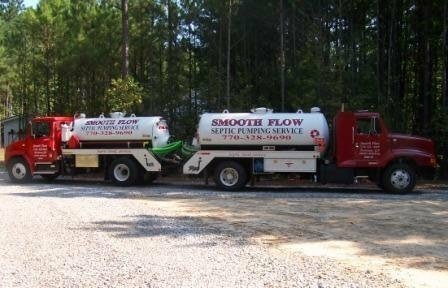 A septic tank in normal condition is $345.00 for up to 1000 gallons and $445.00 for up to 1500 gallons. Crust Buster service is including with all pumping services at no additional cost as long as access to the tank gives space needed and condition of contents are suitable for the use of the equipment. Each of trucks is equipped with 100 ft. of hose to access tanks. To open and check septic tank for problems $145.00. Filter cleaning without tank service 145.00, filter cleaning with service is 45.00. Replace filter is $175.00, replace baffle 225.00. It is not the policy of Smooth Flow Septic to charge for digging unless a tank lid cannot be accessed within 12 inches of digging by hand or if it is an older lid that are appromiately 3 ft. by 4 ft, these lids have not been used since the late 1980’s in our area. It is for the protection of everyone that these large lids are moved with an excavotor. The tractor charge for these jobs are indicated by the type of excavator used, most only require our small tractor, which is 125.00. Current county code for maximum depth for placement of a tank access lids is 12 inches. Should your tank require the use of our tractor to access the lid there will an $125.00 charge for tractor service. Installation of Sewer Popper with existing clean-out is $60.00. Estimates for this work must be done onsite. This service is provided – call for pricing. $40.00 for year supply when purchased with pumping of tank. Purchased alone $40.00 for year supply plus shipping. Smooth Flows SK3 is simple to use. Just drop in the convenient pre-packaged, pre-measured pouches into your lavatory bowl. The plastic pouches dissolve away so you don’t have to handle the powder. NO fuss – no bother – no effort!